My Monthly Giveaways. Helping Out Some Gamers Without Resource Credits. 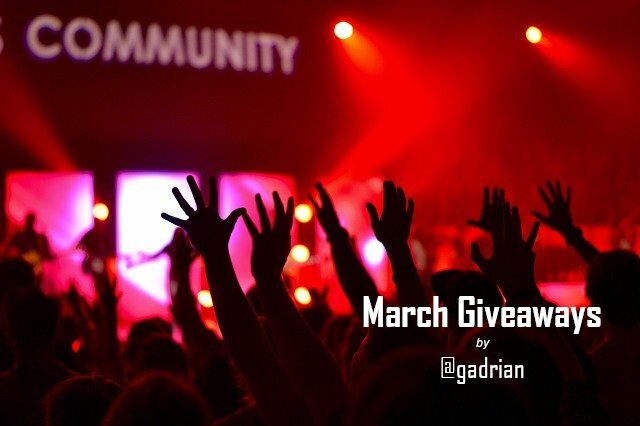 My giveaways for the month of March have a new "target". Many gamers that were attracted by Steem games (or their potential gains) don't have enough Steem Power to play as much as they would like to. Since games have a great potential to onboard new people to the Steem blockchain, a good gaming experience for them helps us all. So they can tell their friends to join as well. But if they don't have resource credits to play that's a bad experience, and they might not easily understand why they can't play more. Well, I decided to help a few such gamers this month, via my monthly giveaways. My liquid Steem is low since I powered it up recently, so I won't be offering any SBI units this month. What I am offering is 4 or 5 delegations (either 4x25 SP or 5x20 SP) to users who are active players on the Steem blockchain and don't have enough resource credits to keep playing. Mainly I am interested in players of DrugWars, because I've seen some people on their discord who ran out of resource credits. Steem Monsters has enough SP to help anyone in need of a delegation to play more, and they do it, so if you run out of resource credits playing Steem Monsters, I'm not sure how it works, but I believe you can ask on their discord and you will receive a delegation from Steem Monsters to allow you to play more. But DrugWars doesn't have the SP to spare, so I thought I'll give a little help here. If you run out of resource credits by playing DrugWars and you want one of the delegation giveaways I offer, please comment below. Please don't apply if this is your alt! If that's the case, delegate to it yourself! If you know someone who would match the criteria above, please let me know in the comments too, by saying their username. Delegations will run for ONE MONTH, after which I will undelegate. Make sure you have enough SP in your account to accommodate your play style, by the time I undelegate. Delegations will be offered on Sunday, most likely, or if not, on next Monday. If there are more comments (candidates) than the available delegations, I'll select the receivers from the ones who commented, up to the available delegations. Your UA account score is currently 3.300 which ranks you at #8117 across all Steem accounts. Your rank has improved 10 places in the last three days (old rank 8127). As I was saying in discord, I'm glad you received the SP to play now. I'm sure some others might need the little boost, because I've seen this issue more than once showing up in discord.